robisher's Arctic expeditions have long been accounted an historical dead-end. Yet there were a number of respects in which they were significant for the future of North America, Britain, and Nunavut. They mark a beginning for the English preoccupation with finding a northwest passage, which led to the discovery and exploitation of the Hudson Bay area. Even as Frobisher's mission was being diverted from exploration into mining, Francis Drake was being allowed to see if he could find the Pacific end of such a passage. The passage proved an elusive goal for centuries, drawing explorers, traders, and eventually settlers, northward and westward. The beginning made by Frobisher was the foundation of the British crown's claim to the region - a claim in the late nineteenth century (by then with more substance attached) transferred to Canada. Even though Frobisher's claim to Meta Incognita, on behalf of his queen, was not followed by occupation, it gave English explorers a theoretical stake in the area and may be perceived as leading to the future integration of the Arctic regions with Canada. From the perspective of the history of exploration, the 1576 voyage represented a courageous attempt to go beyond the boundaries of the world (as known to Europeans), with minimal knowledge of what might be encountered. Without detailed charts or the ability to measure latitude, the three expeditions managed to make their way through mist and tempests, rip-tides and powerful currents, and above all the ice-laden waters, in ships not built for such extreme conditions. 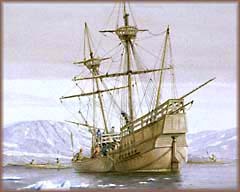 During the 1576 visit of the Gabriel to Frobisher Bay, the ship's boat prepares to carry five sailors ashore. By contrast, the 1578 voyage was part of a larger industrial enterprise, which also produced the most extensive smelting works built in England up to that time. It was a very challenging undertaking to organize, outfit, and hold together the largest fleet to visit the Baffin waters until the twentieth century; yet this fleet achieved a landfall of pin-point accuracy on the far side of the Atlantic. Furthermore, both the second and third voyages achieved their goals (excepting colonization) in terms of transporting hundreds of men to undertake mining operations in a hostile environment and to bring back huge quantities of ore - it was not their fault that the ore proved worthless. Under such hazardous and difficult conditions, the relatively low loss of ships and life was in itself an extraordinary feat. 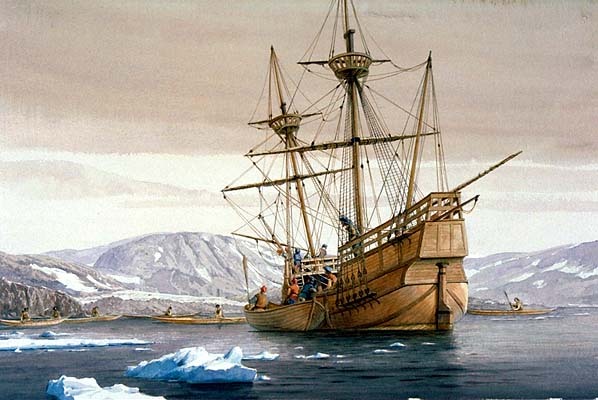 More important, the Arctic expeditions contributed to the process, which only really began in the 1550s, of transforming England into a maritime nation capable of challenging the previous Iberian superiority in maritime technology and expertise. English masters and mariners obtained new experiences and rigorous training in unfamiliar waters, along with greater self-confidence in their ability to challenge maritime achievements of sailors of other nations. Many of the seamen tested in these ventures went on to man or even command the Queen's ships in later missions. The expeditions even resulted in the first exclusively English contribution to the science of navigation: measurements taken to document magnetic variation of the compass allowed demonstration of the inequality of such variations. These voyages demonstrated the capacity and ambition of the Elizabethan regime to become a player in the field of maritime exploration. This included the possession of theoretical (geographic) knowledge and practical (navigation) knowledge, the ability to construct sturdy ships, to plan for the provisioning of lengthy expeditions, and planning for colonization in distant locations. Much was learned from the 1576-78 expeditions in these regards, both from their achievements and their failures. The expeditions also offered new contributions to the cartography of that part of the world. However, the Privy Council - not wishing that this knowledge fall into the hands of rival nations - either restricted the circulation of maps produced as an outcome of the expeditions, or required their editing or simplification before being made public. This, together with mistakes in integrating the new information with established cartographical orthodoxy, resulted in the correct location of the Frobisher sites being forgotten. 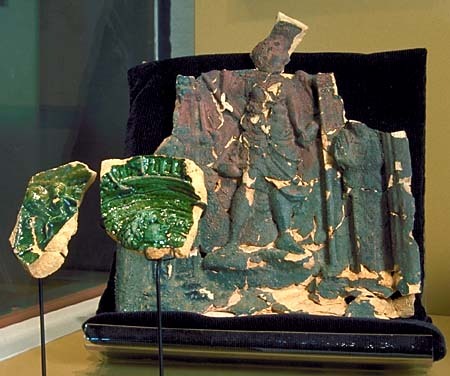 Perhaps above all, the Frobisher voyages - which deposited in North America the oldest archaeological remains of the English-speaking peoples - signalled England's awakening interest in empire. The colonization initiative may have been a false start, but it was nonetheless a start. It gave impetus to future proposals for settlement along Atlantic shores. "in the broader sweep of history the Frobisher expeditions may be seen as an episode of considerable significance, regardless of their clear failure in terms of their immediate objectives." 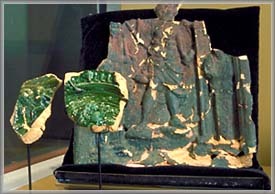 Portions of glazed stove tile. This tile must have come from a type of German stove brought to Kodlunarn Island in order to provide heat for the planned wintering-over. For the Inuit who inhabited the region visited by Frobisher, the significance of his voyages was also to prove far-reaching. They drew the attention of the English to that area, illustrated the disregard with which indigenous rights in the land would be treated by future explorers, and provided an initial infusion of foreign commodities - materials such as tile and metal - whose possible effects in reshaping Inuit economy and society are still being studied. The course of history of the Inuit as much as that of the English had taken a new turning, although neither people realized it in 1578.